Knoco stories: KM definitions - good, bad and ugly? KM definitions - good, bad and ugly? Two years ago I blogged an analysis of a list of KM definitions. Here is a fresh look at a new list. The analysis of the previous list showed a few "definition clusters", as well as a definitional split between those who define KM in terms of knowledge, and those who define Km in terms of information. The new list, which allows us to revisit this analysis, was created by KM Australia, and you can find it here. It contains 183 entries, but a couple are duplicates and many are not definitions, but commentary on (for example) why definitions are difficult. About 147 entries are real definitions. The first thing we can do with this list is create a word cloud, shown here. 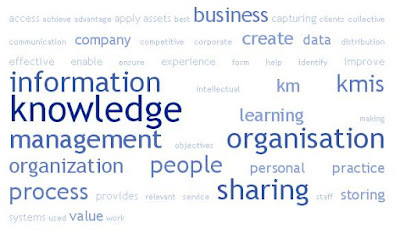 The word Knowledge is prominent in the list, as we might expect in a series of definitions about Knowledge Management. However Information is quite prominent as well, possibly the joint second largest term, together with "organisation". So lets start to subdivide and categorise the definitions. I categorised them by the main subject noun - such as "Knowledge Management is the management/sharing/capture/organisation of X" where X is the subject noun. Then I counted how many times the following nouns appeared as the subject, either individually, or as a shared subject. I plotted the results below in a cross-plot, so we can see the frequency of these nouns individually or in pairs. You can see, for example, that 63 definitions used solely the word "knowledge", such as "To harvest and store Knowledge within the company to increase productivity ". 1 definition includes "knowledge" and "know-how" as in "(managing) Your Knowledge and your Know-how : An Asset to improve every day"
The matrix shows exactly what we saw two years ago - a set of "definition clusters" which I have marked on the matrix in colours, with green, amber, red representing how much I personally support these definitions. The green cluster contains the definitions I personally prefer, which define KM in terms of knowledge and (to a much lesser extent) experience and know-how. For me these are GOOD definitions. Management of knowledge should, at its heart, focus on Knowledge. In the orange cluster, top right, we see definitions which mix the terms Knowledge, Information and Data. I feel these definitions should be treated with caution, as they blur the boundary between KM, IM and DM. Certainly there are times when knowledge is transferred in documented form, and these documents are subject to information management processes. however KM is concerned primarily with the content of the documents, and how this may be used to help another person develop their knowledge. IM is concerned more with how these documents are stored, characterised, and made findable. The orange cell is where we see definitions based on "intellectual assets" or "intellectual capability" (an example would be "Management of the intellectual property of the organisation - using many and varied techniques"). I see what these definitions are getting at, but worry that they leave open the question "what is intellectual property" and they run the risk of focusing on patents and intellectual property. In conclusion the confusion between KM and IM remains, with about 20% of the definitions on this list talking only about information and data, and not about knowledge at all. However about 50% of the definitions are firmly in the knowledge domain (the green sector) which is an improvement on the 40% in the green cluster 2 years ago. Please note that in no cases are the terms knowledge and Information defined.